At my school we are only allowed to have two celebrations per year, once before Winter Break, and once at the end of the school year. However, I am all about sneaking in fun and celebrations wherever I can. I strongly believe in rigorous content and not filling my day with fluff.....but occasionally first graders need a chance to be 6 years old. Am I right? I first began using Napkin Books years ago and it is one of my favorite ways to inspire my students to write. I have blogged all about them here. 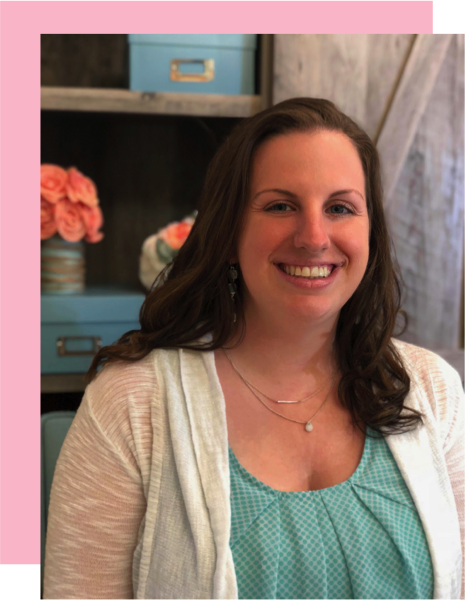 Today I am going to show you how to use simple decorative napkins as a meaningful way to spread kindness and celebrate the occasion. 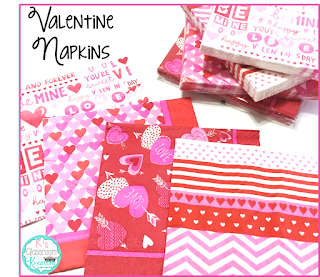 First, you will need a pack of Valentine themed napkins. I like to buy my napkins at Dollar Tree or craft stores (with a 50% off coupon). I also like to stock up after each holiday when things are on clearance to save for the following year. Yes, I am a crazy lady napkin hoarder. Pass out a stack of blank paper to each child, I use white copy paper. For example, if you have 18 students in your class, every child receives 17 pieces of paper. If you have 25 students, pass out 24 to each child. I pre-cut the paper to match the size of my napkins (or slightly smaller so I can fit two to a page). 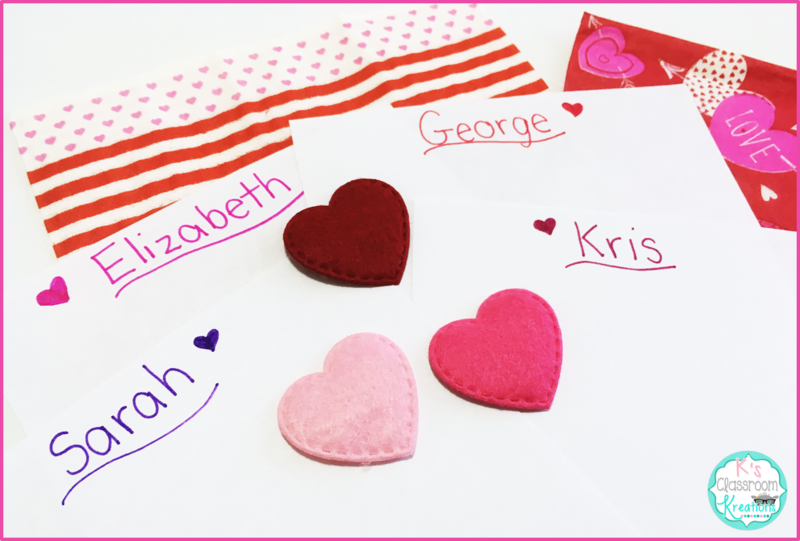 Have each child write one student name per piece of paper. I find this process easier if I call out one name at a time, spell it out loud for students, and they write it as I spell. This way, all names are spelled correctly and we don't forget anyone. 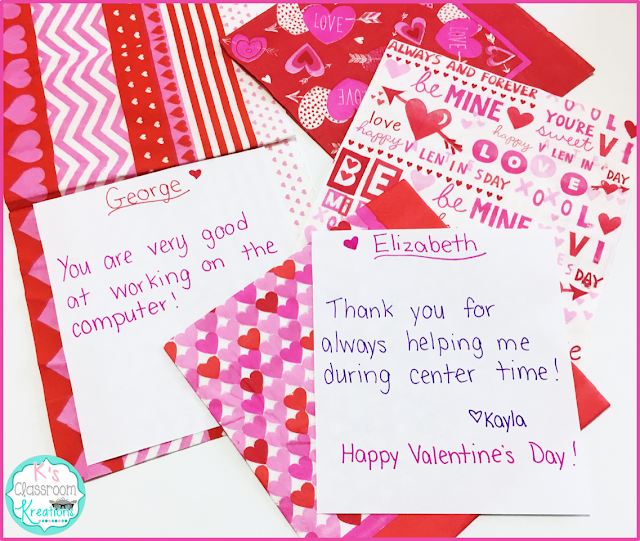 Next, give students time to write one compliment on every piece of paper about the person whose name is on it. This could be something they love about that person, a strength that they see in them, or a general compliment. This step may have to be broken down into small chunks throughout the week, especially if you have a large class. Once everyone finishes writing their compliments, students will pass out the pages to the child they wrote about. At the end, everyone will have a pile of notes from every person in the class. 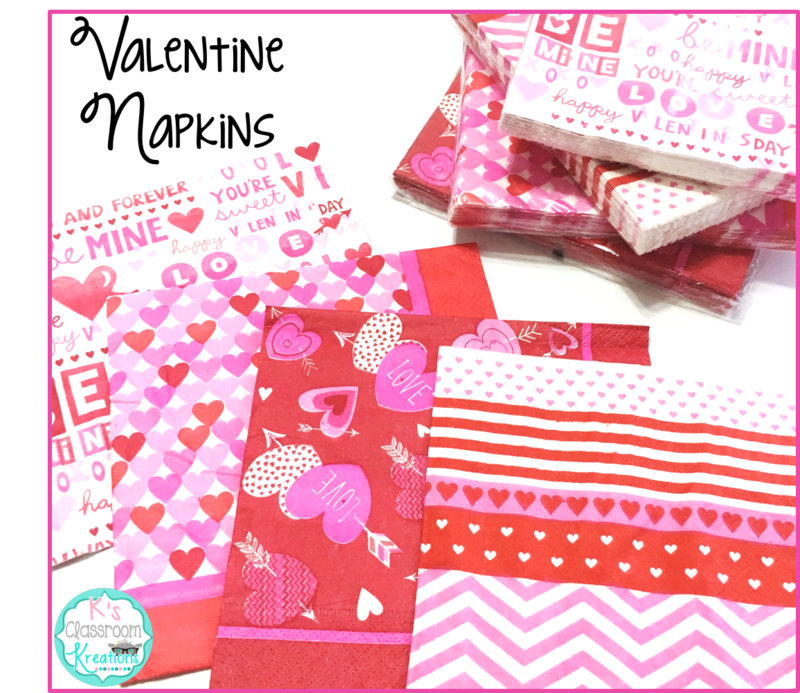 I simply staple the pages into a Valentine themed napkin and ta-daaaaa! Instant book! These messages are much more personal than a box of pre-packaged cards. 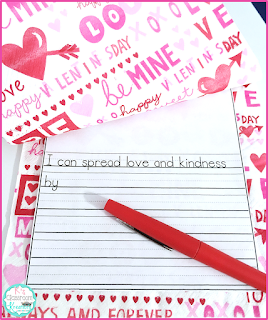 Plus, students have the opportunity to practice writing and being kind. Win win! 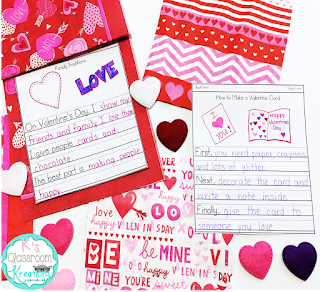 If you prefer to have lines already on your paper or a template for your struggling writers, I do have a set of Valentine Napkin Book writing prompts with over 45 prompts about love, kindness, friendship, Valentine traditions, and more! Just click one of the images below to see what's included. 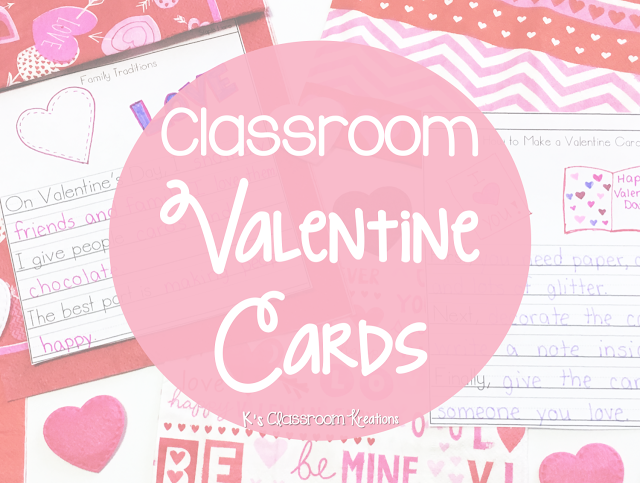 What's your favorite way to spice up a classroom tradition like Valentine cards? 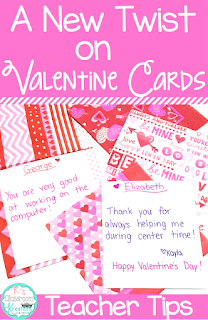 Wow what a fun and creative approach towards valentines day and so interesting for the kids as well. Very innovative of you, good work. Hope to see more posts from you soon.